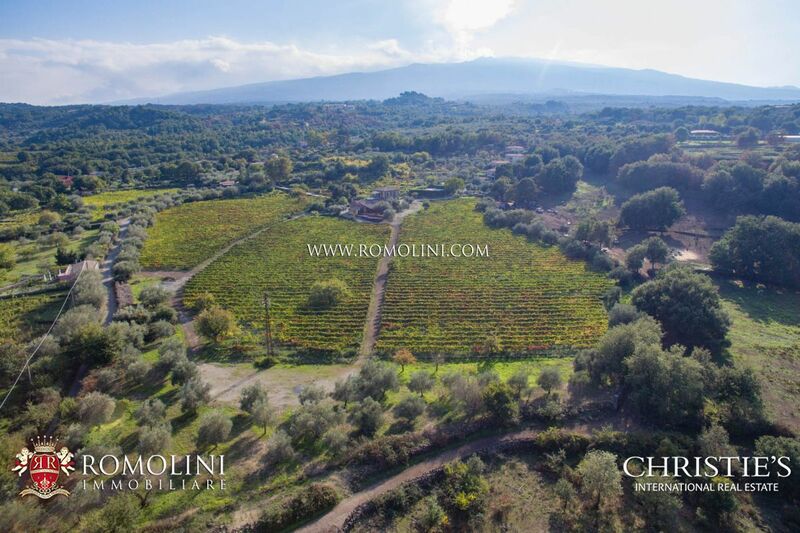 Not far from Castiglione di Sicilia, at the foot of Mount Etna, wine estate with Agriturismo, Etna DOC vineyards and cellar. 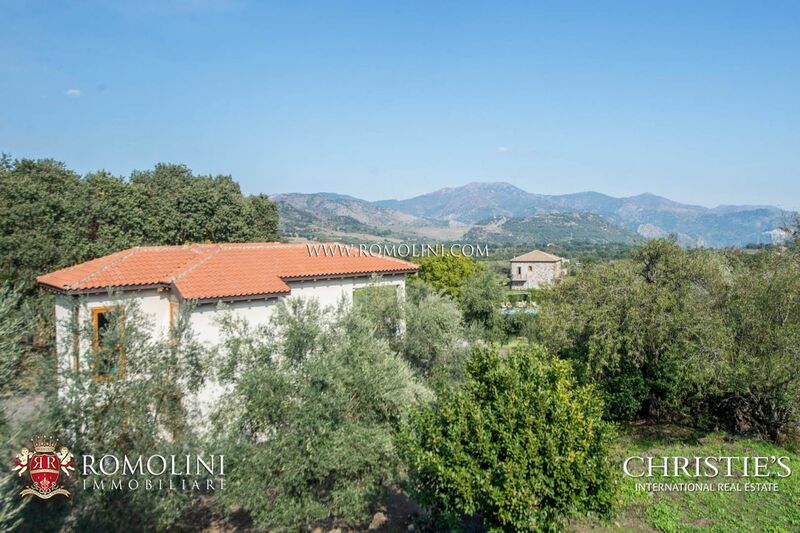 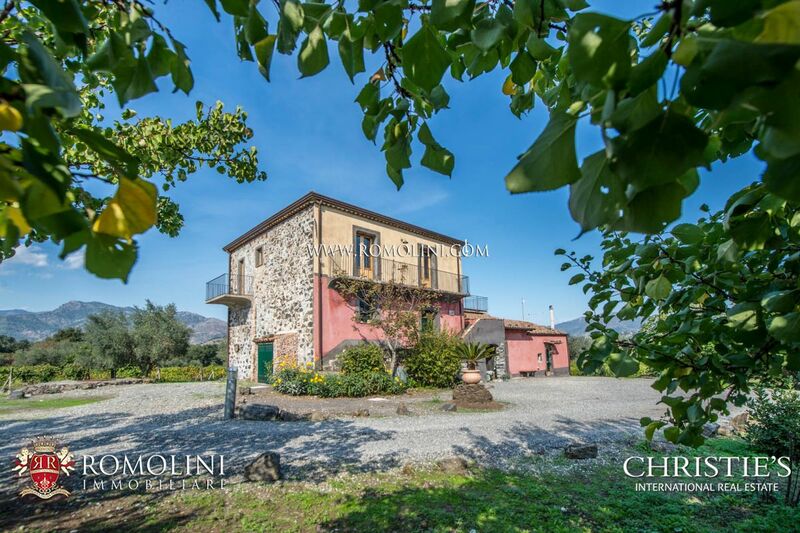 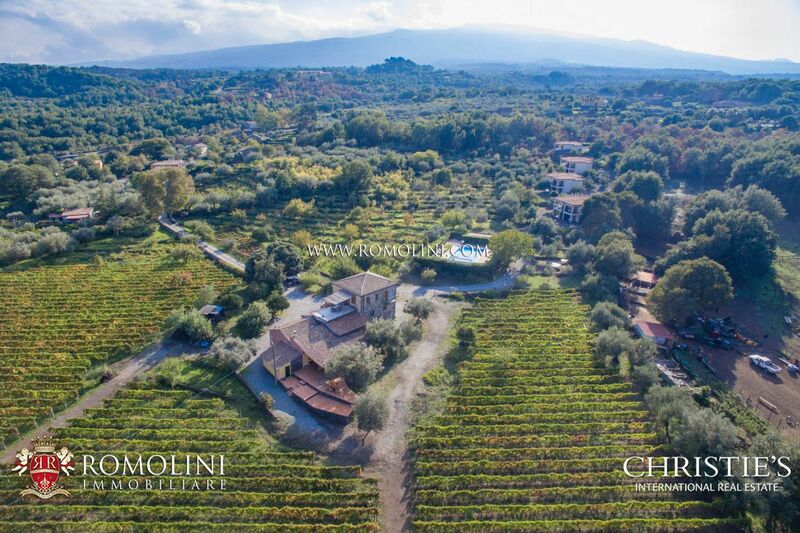 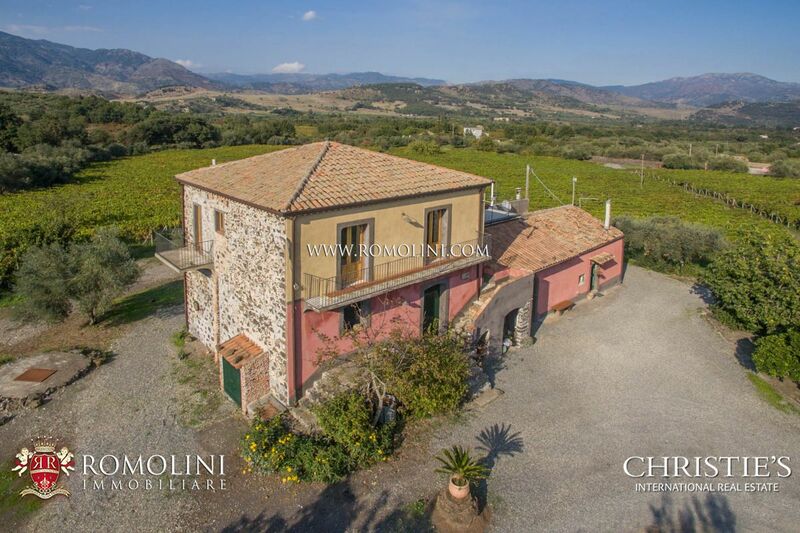 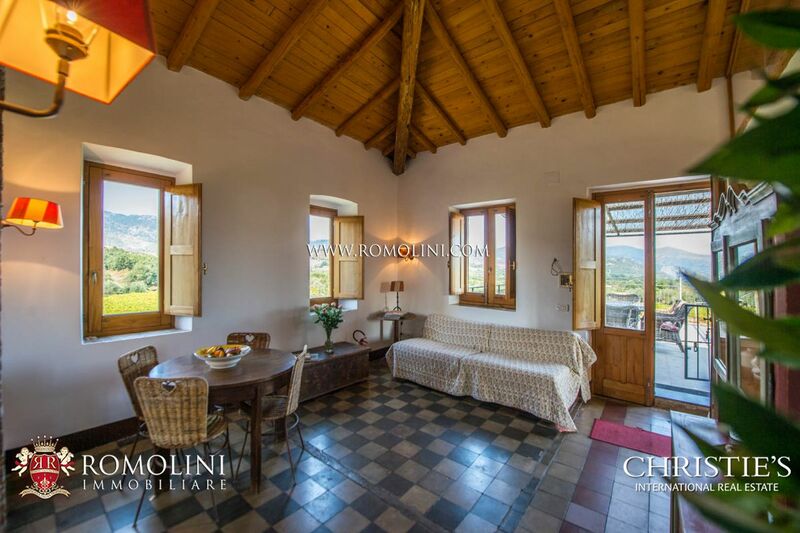 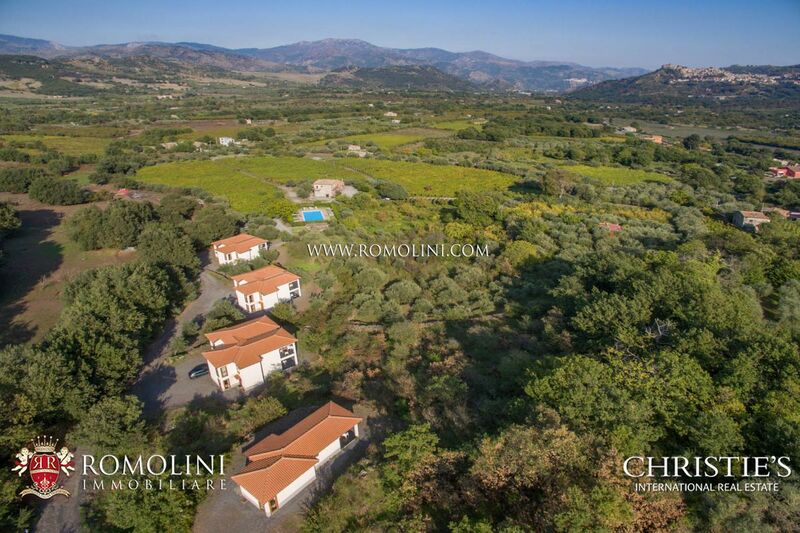 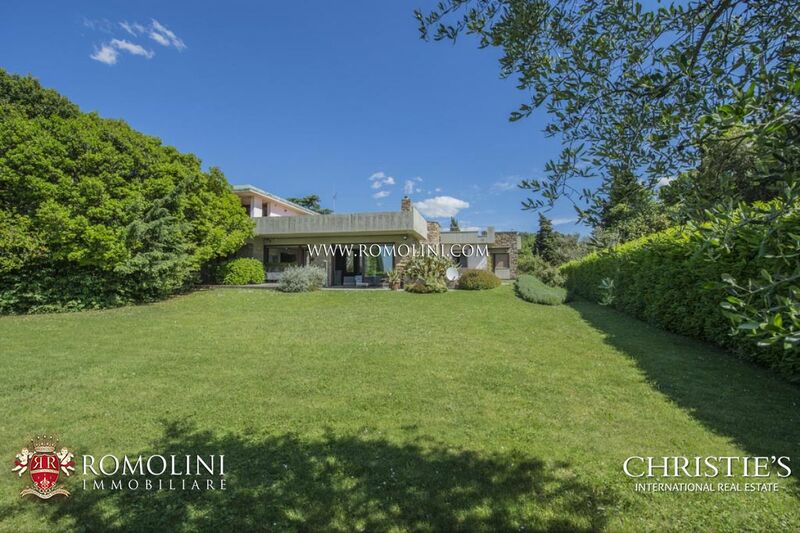 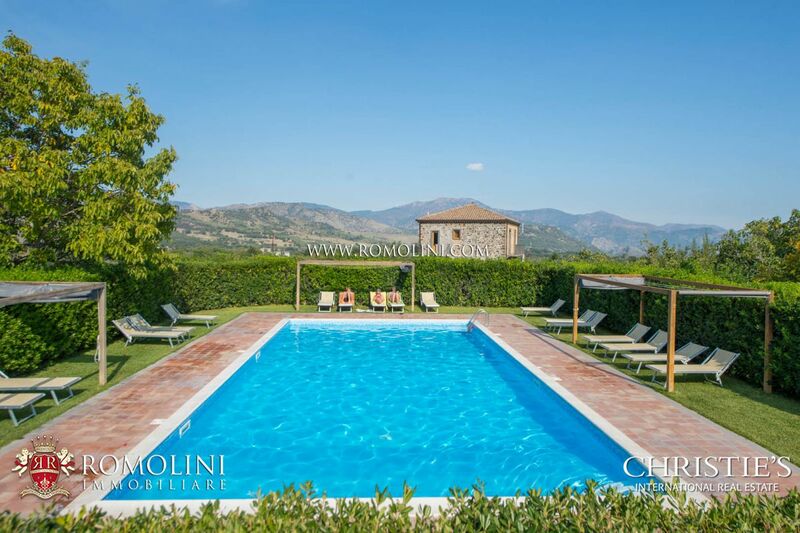 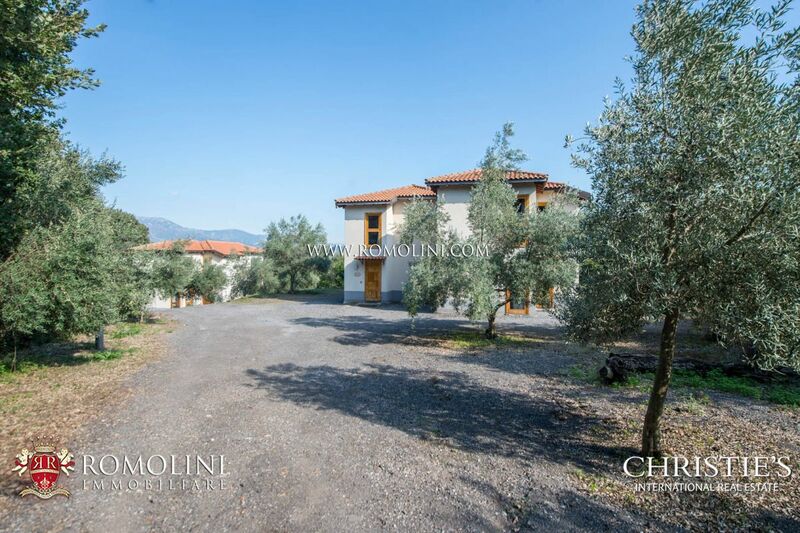 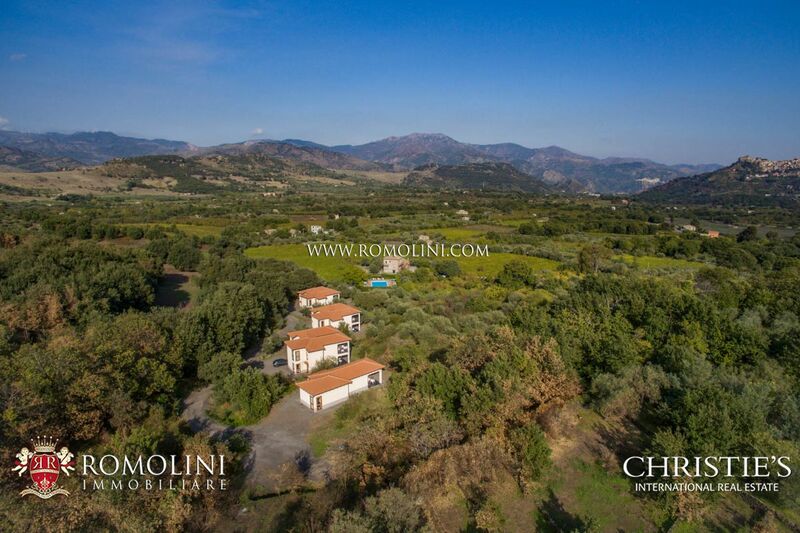 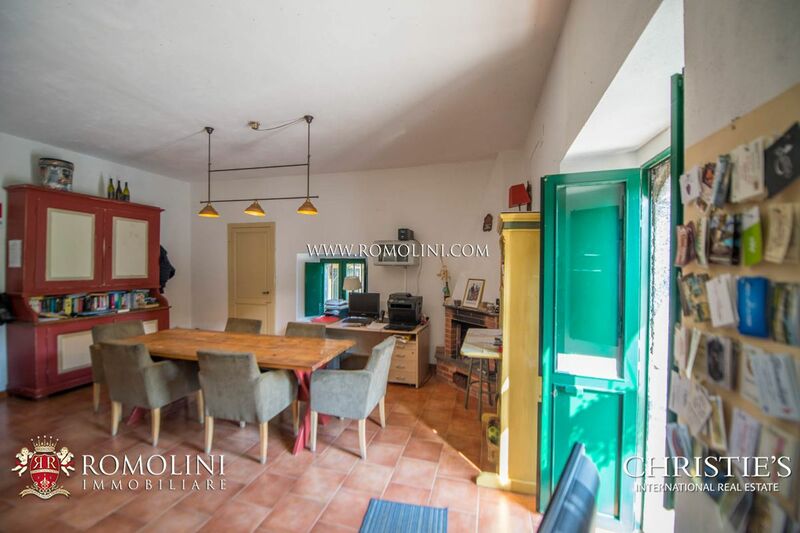 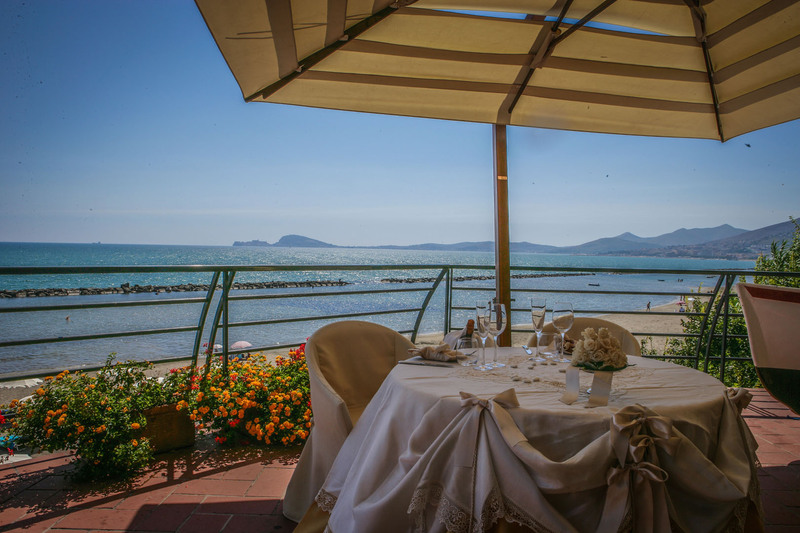 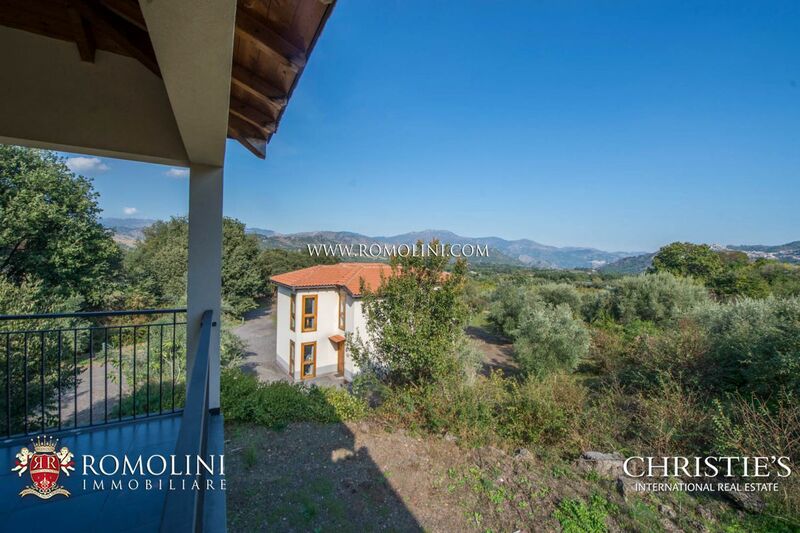 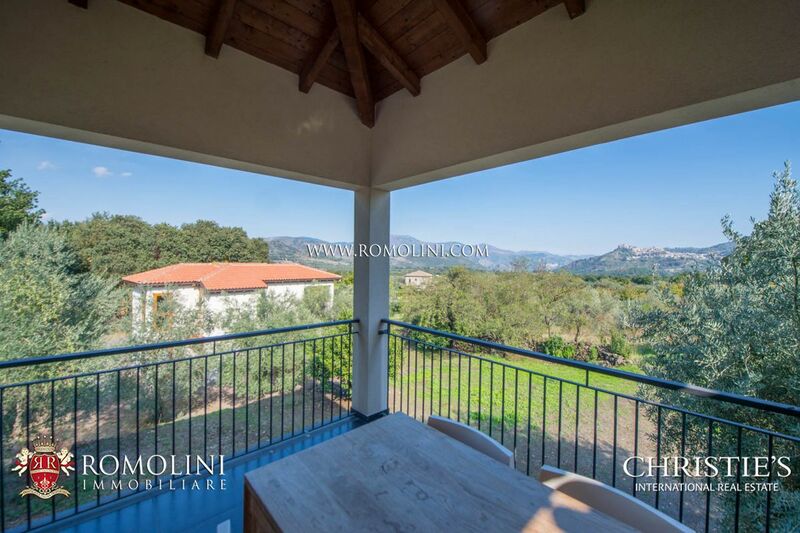 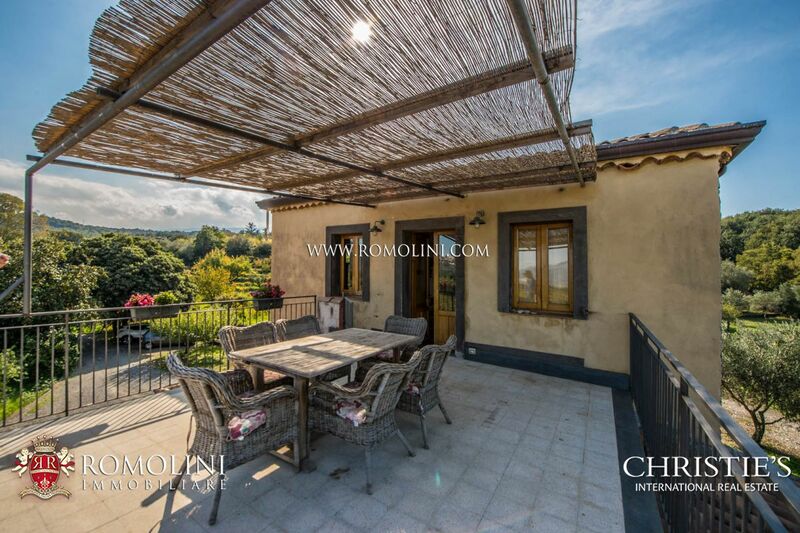 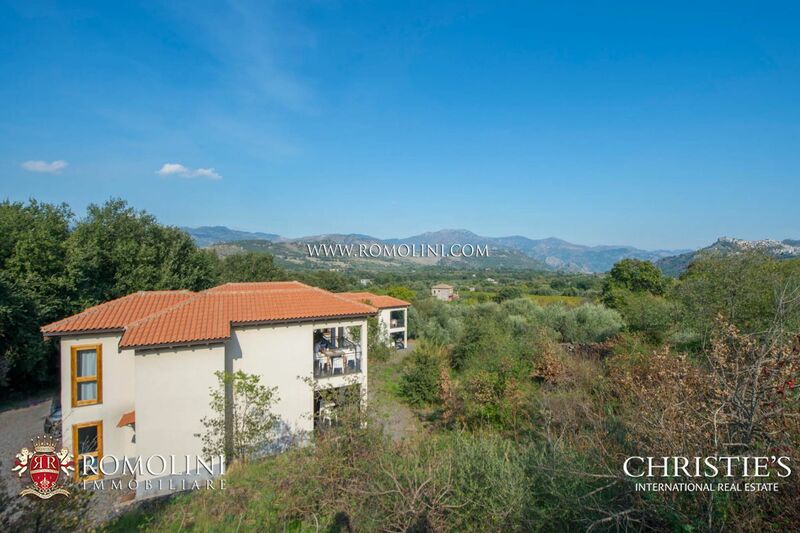 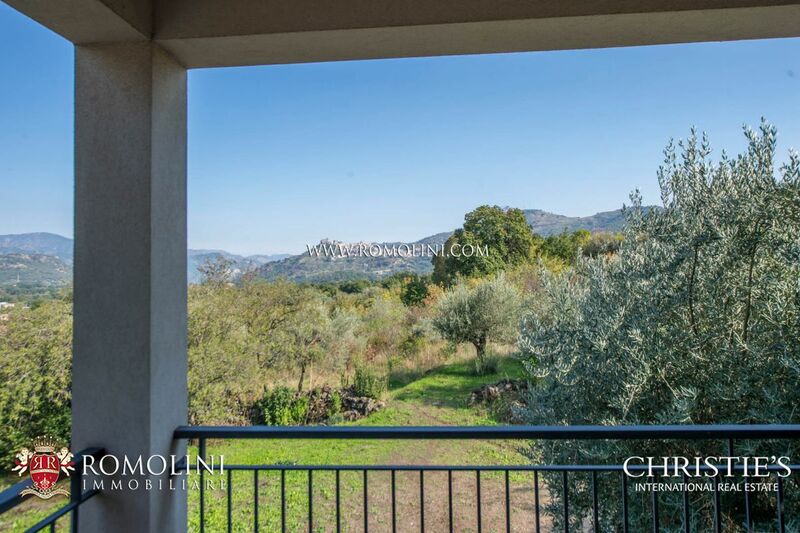 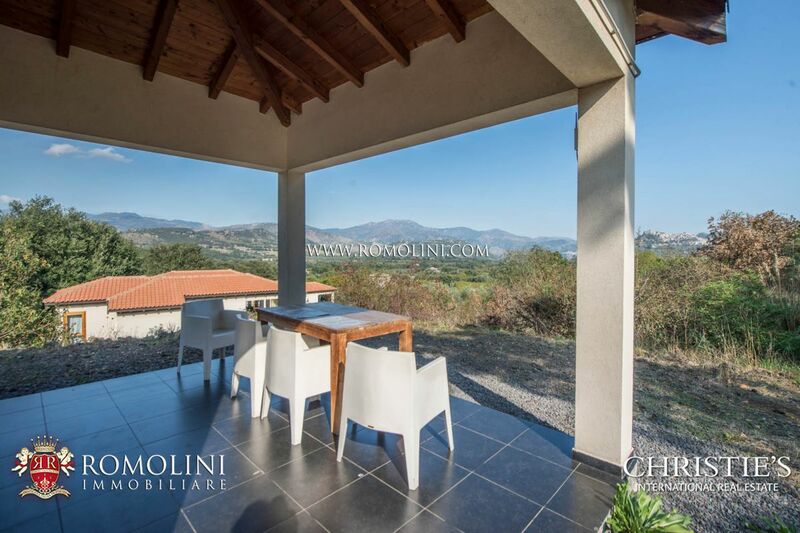 Easily reached via the municipal road network, the property is located not far from a center with all the services (4km; 10’) and grants a quick access to the several of the most known towns of Sicily: Castiglione di Sicilia (4km; 10’), Taormina (35km; 55’), Acireale (46km; 55’), Catania (57km; 1h 10’), Barcellona Pozzo di Gotto (68km; 1h 40’), Messina (77km; 1h 20’), Siracusa (123km; 1h 50’) and Palermo (264km; 3h 10’). 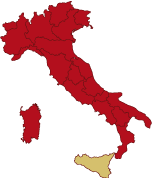 Sicilian airports are Catania Fontanarossa (70km; 1h 10’), Palermo Falcone & Borsellino (294km; 3h 30’), Trapani Florio (375km; 4h 15’) and Ragusa Comiso (146km; 3h 5’). 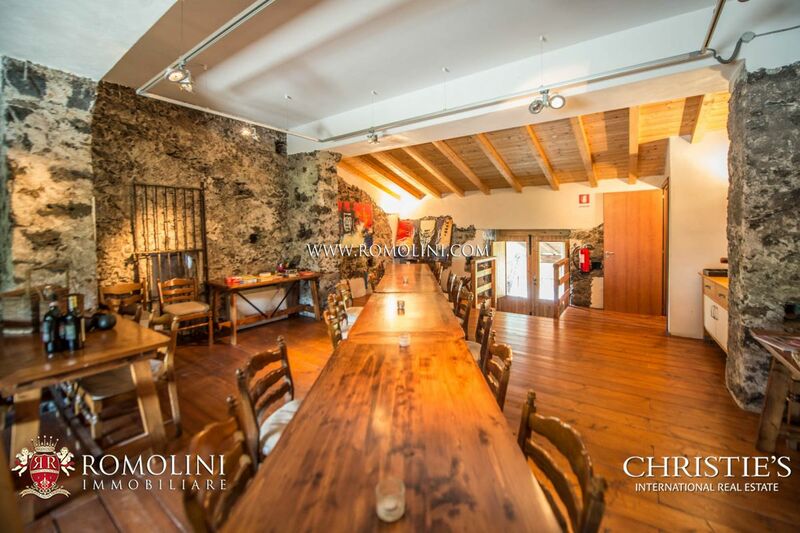 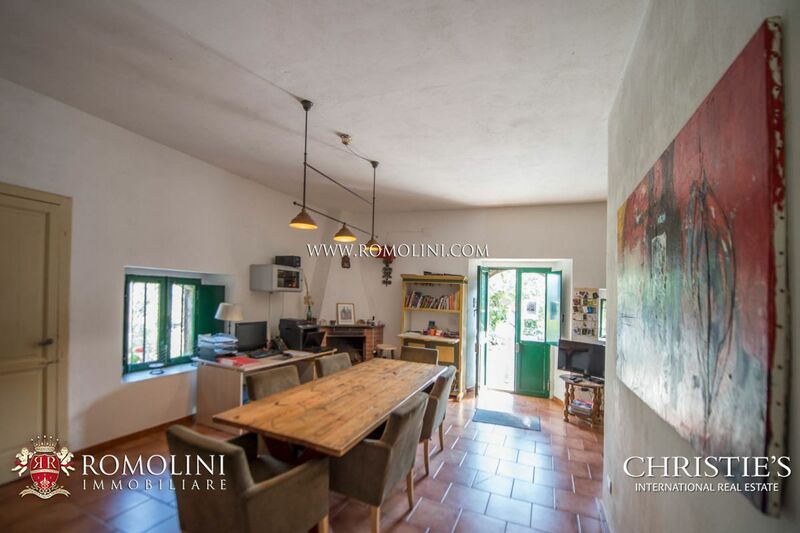 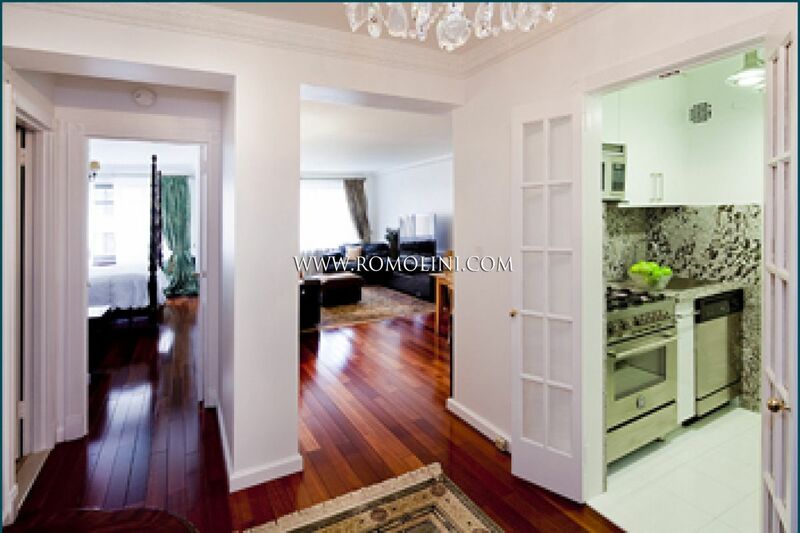 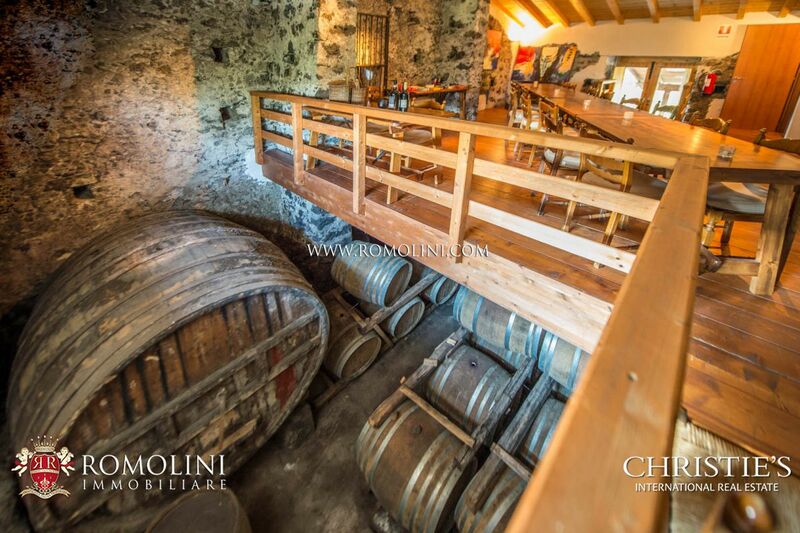 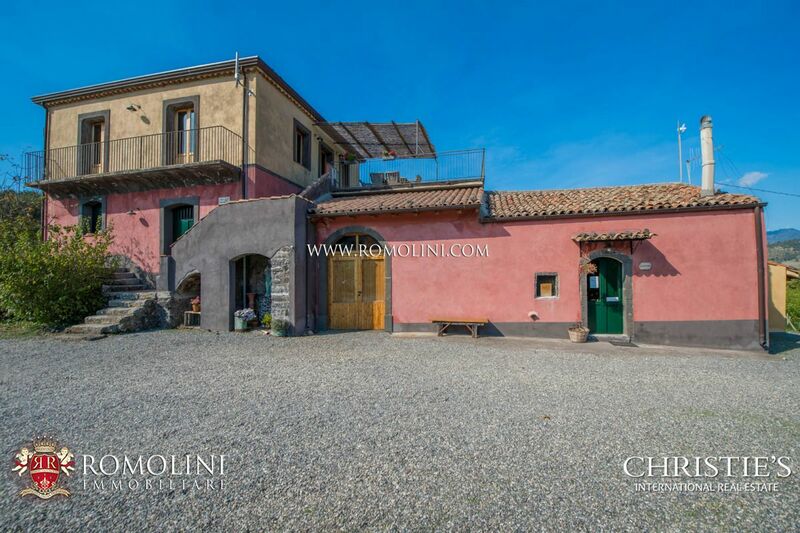 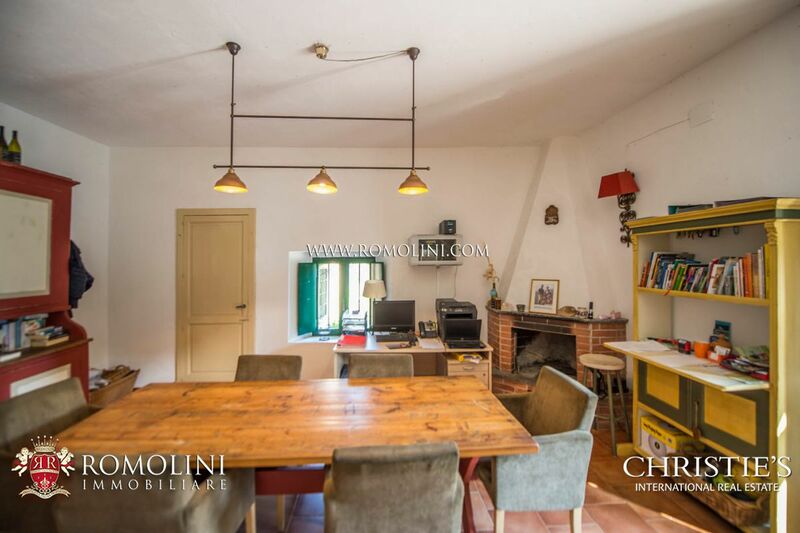 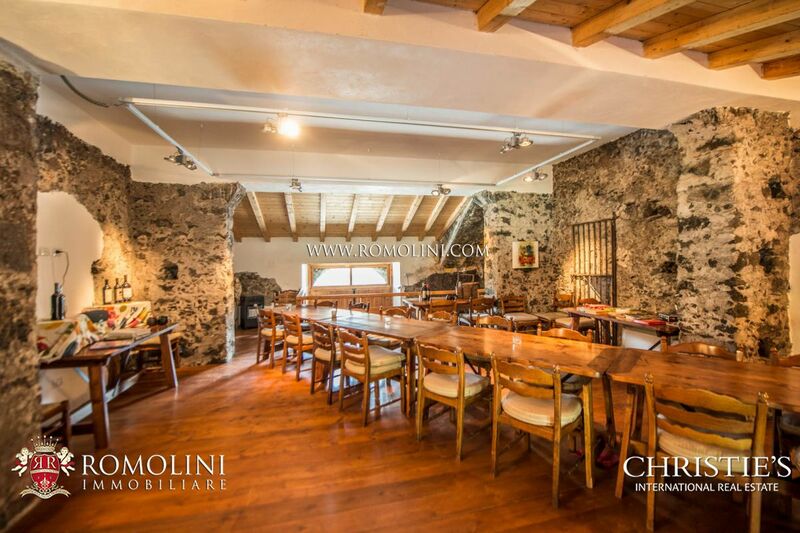 - Ground floor: here we find the reception for the business, the cellar on two floors (currently used as storage for wines and sometimes as wine tasting/dining room) and the owner’s apartment with 1 double bedroom and bathroom. 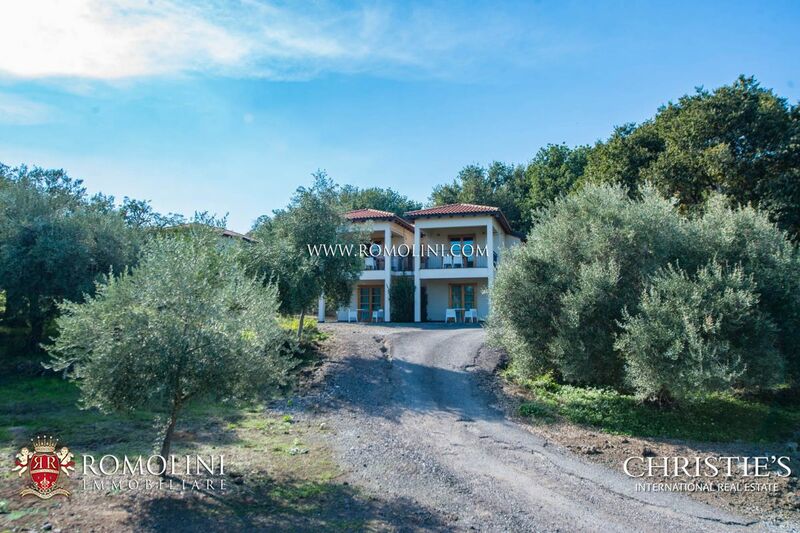 On the outside there is a large terrace. 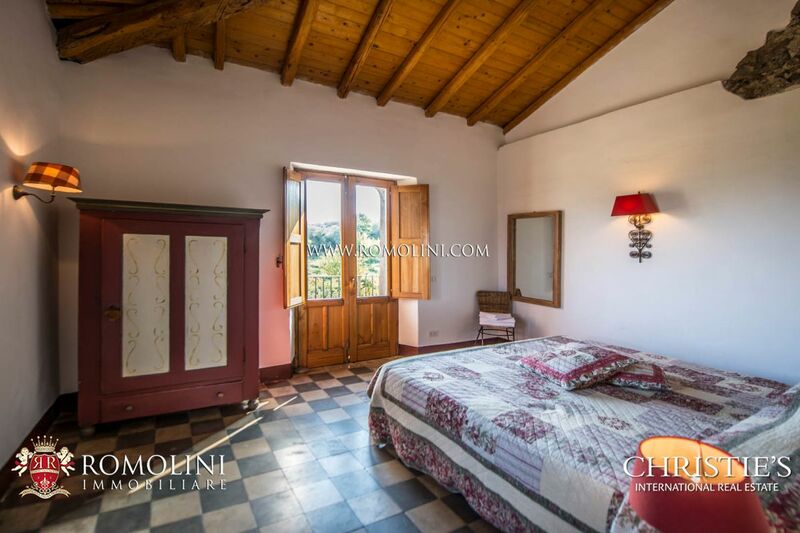 - First floor: we have here an independent apartment (65 sqm – 699 sqft) accessed via an external staircase and made up of living room (sofa-bed), kitchen, 2 twin bedrooms (convertible into double bedrooms if needed) and bathroom with shower. 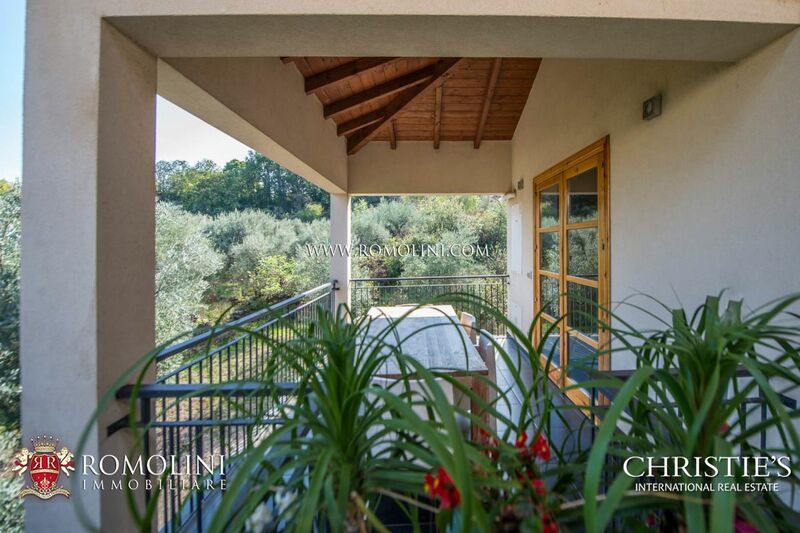 On the outside there is a private terrace built right over the rooftop of the ground floor. 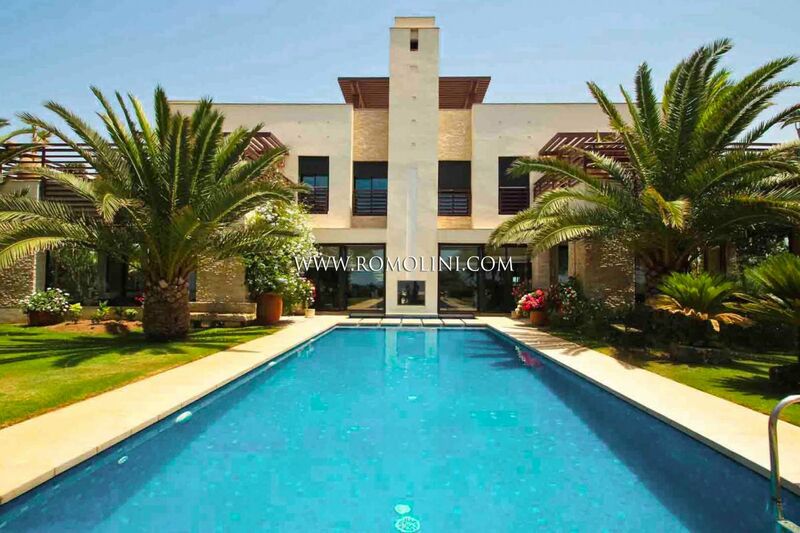 The other buildings, four in total and recently built, are organized into luxury holiday houses. 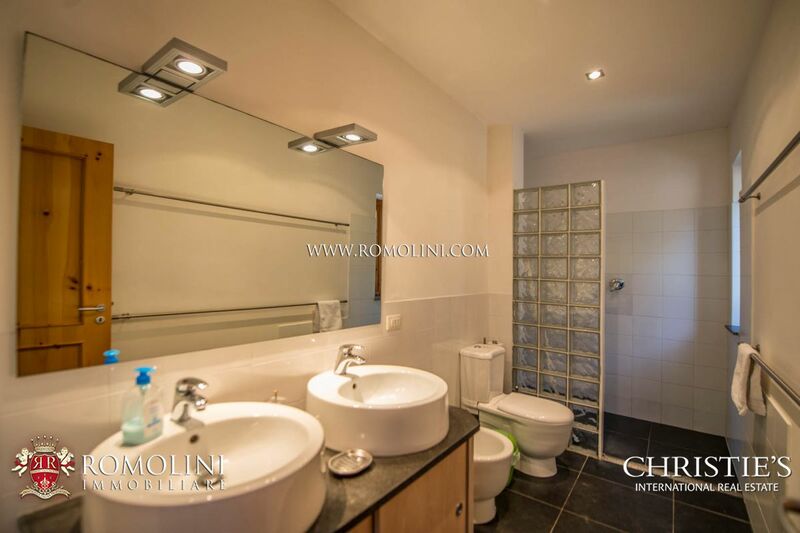 - Apartment N°1 (60 sqm – 646 sqft): double bedroom with portico, bathroom and covered terrace (ground floor) + living room with sofa-bed, kitchen and covered terrace (first floor). 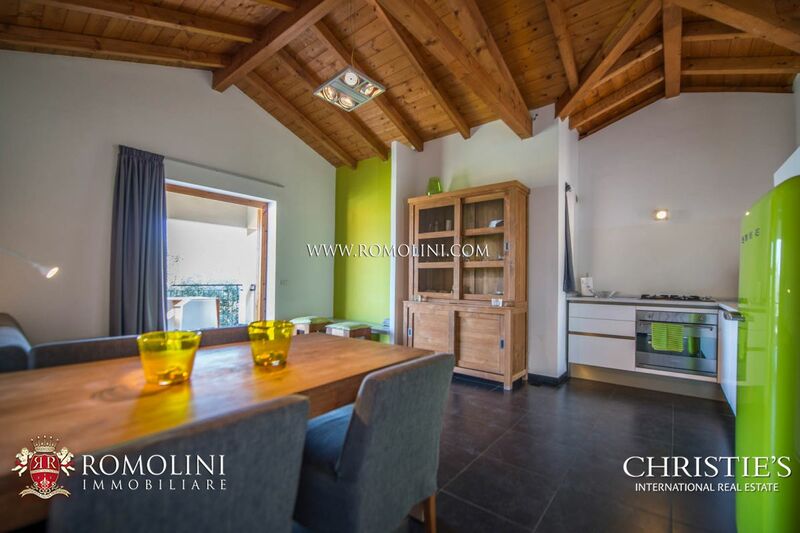 - Apartment N°2 (90 sqm – 968 sqft): 2 double bedrooms with portico, bathroom and covered terrace (ground floor) + large living room with sofa-bed, kitchen and covered terrace (first floor). 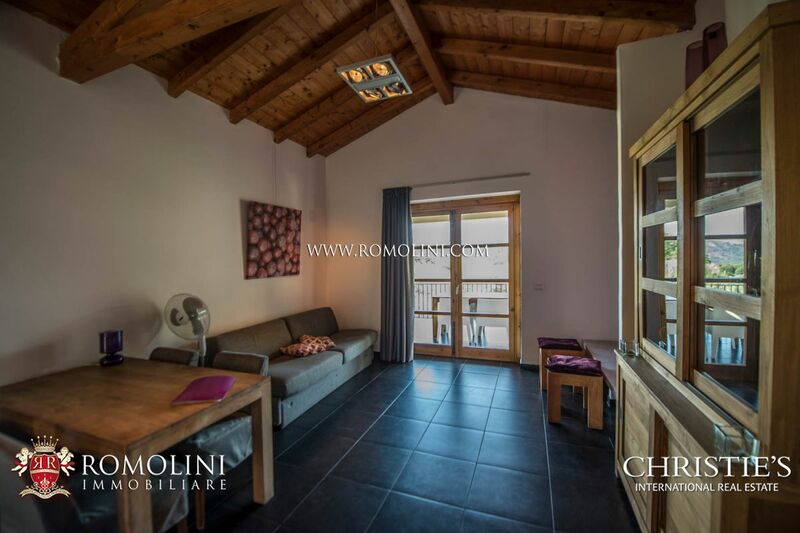 - Apartment N°3 (60 sqm – 646 sqft): double bedroom with portico, bathroom and covered terrace (ground floor) + living room with sofa-bed, kitchen and covered terrace (first floor). 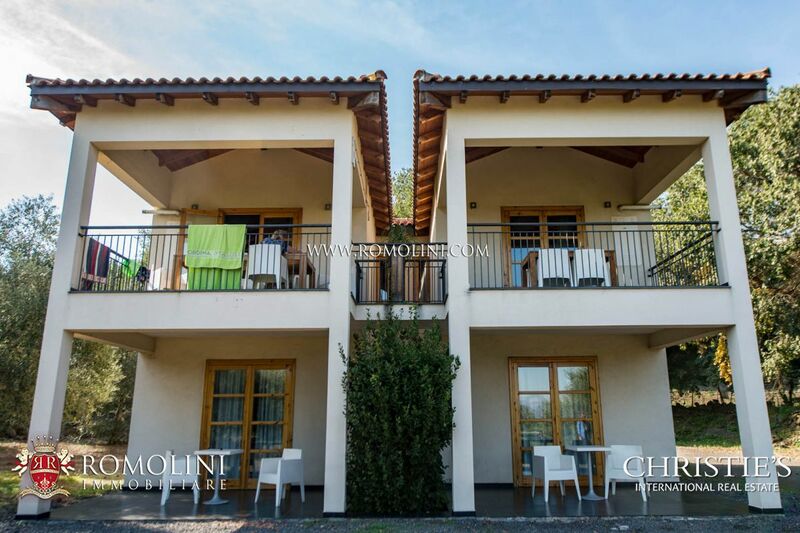 - Apartment N°4 (90 sqm – 968 sqft): 2 double bedrooms with portico, bathroom and covered terrace (ground floor) + large living room with sofa-bed, kitchen and terrace (first floor). 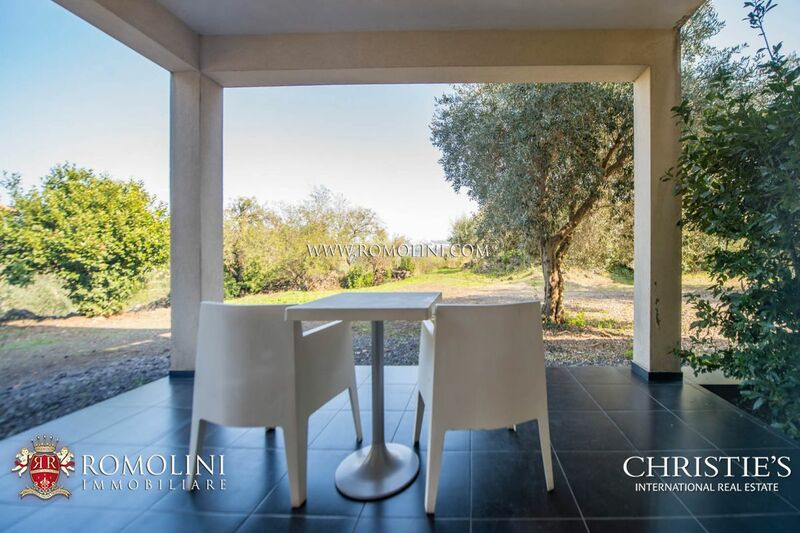 - Apartment N°5 (60 sqm – 646 sqft): double bedroom with portico, bathroom and covered terrace (ground floor) + living room with sofa-bed, kitchen and covered terrace (first floor). 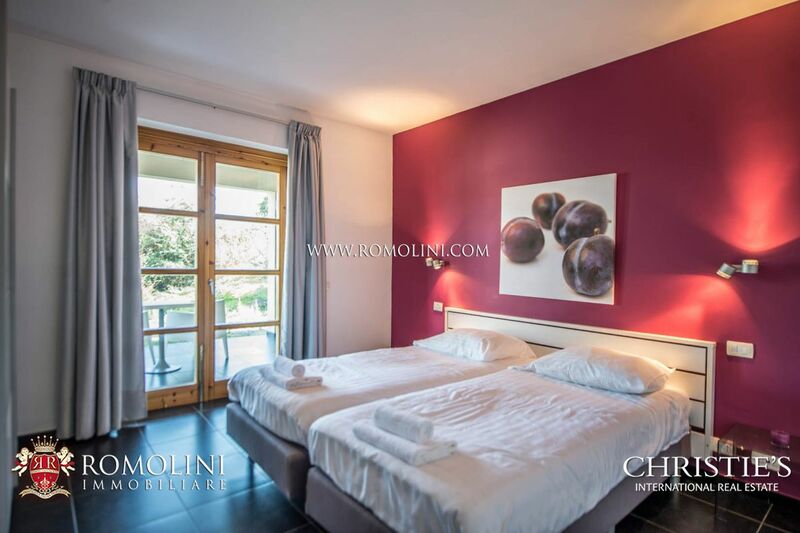 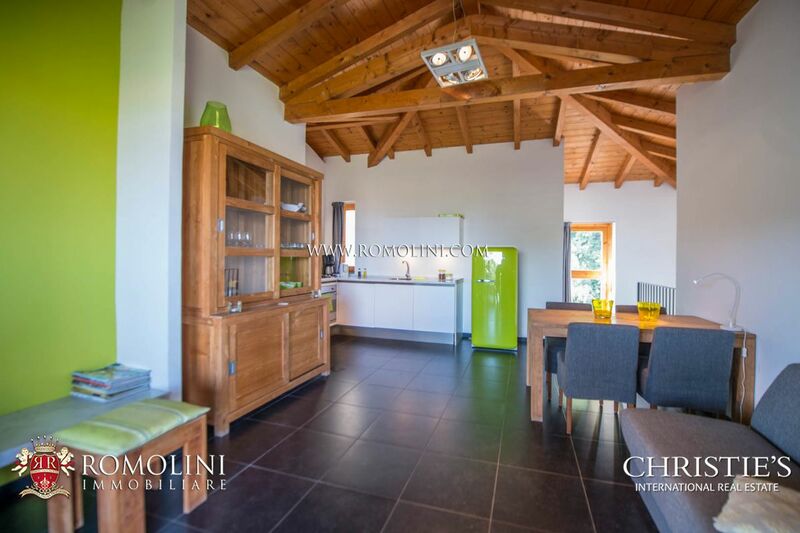 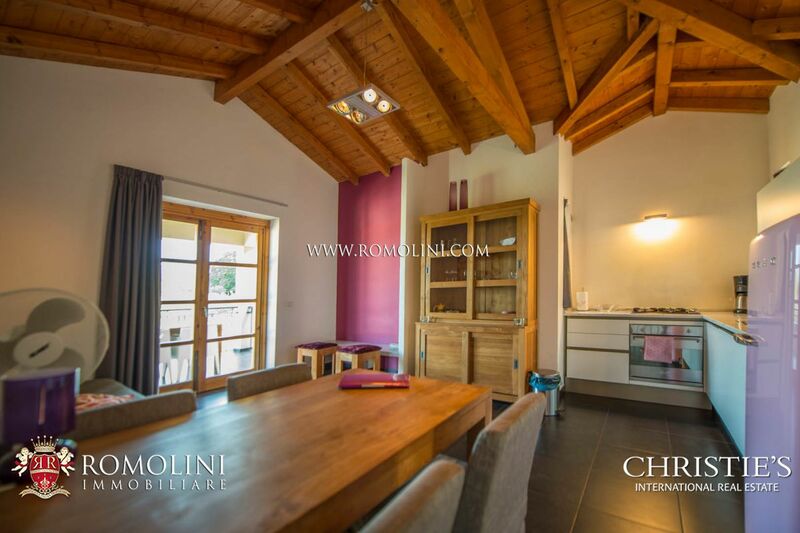 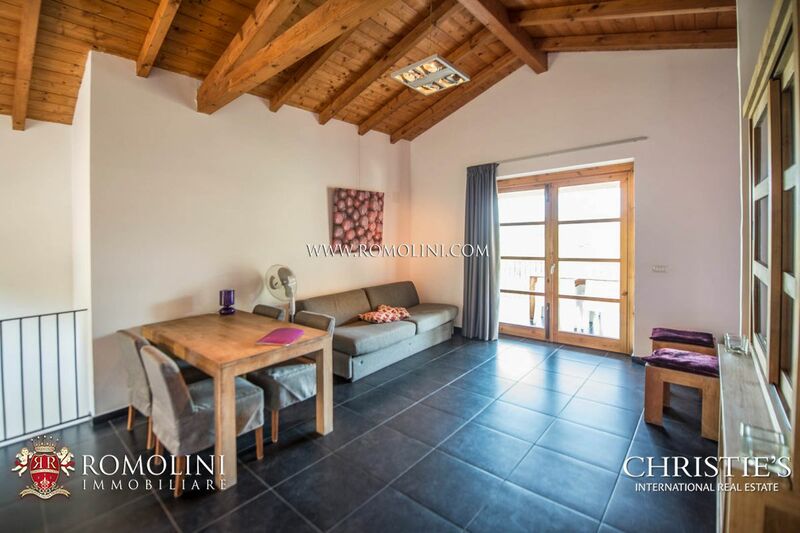 - Apartment N°6 (90 sqm – 968 sqft): 2 double bedrooms with portico, bathroom and covered terrace (ground floor) + double bedroom, living room with sofa-bed and kitchen (first floor). 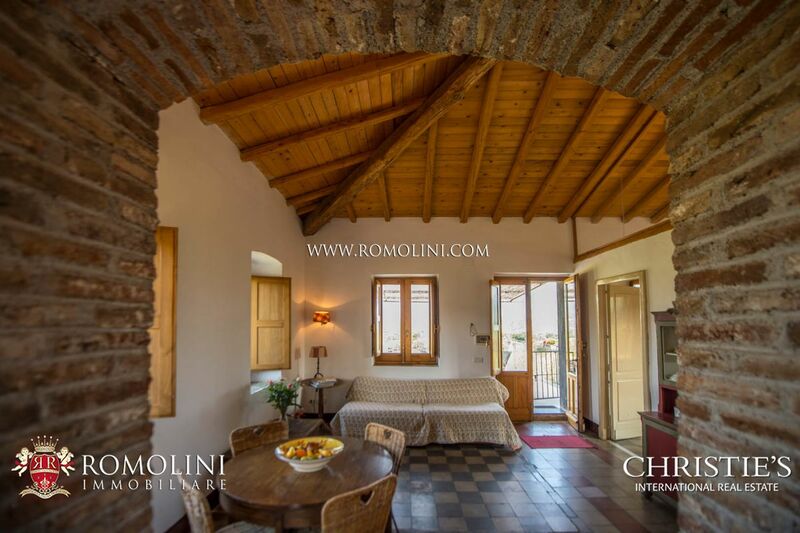 - Apartment N°7 (60 sqm – 646 sqft): double bedroom with twin beds, bathroom, living room (with sofa-bed), kitchen, portico and covered terrace. 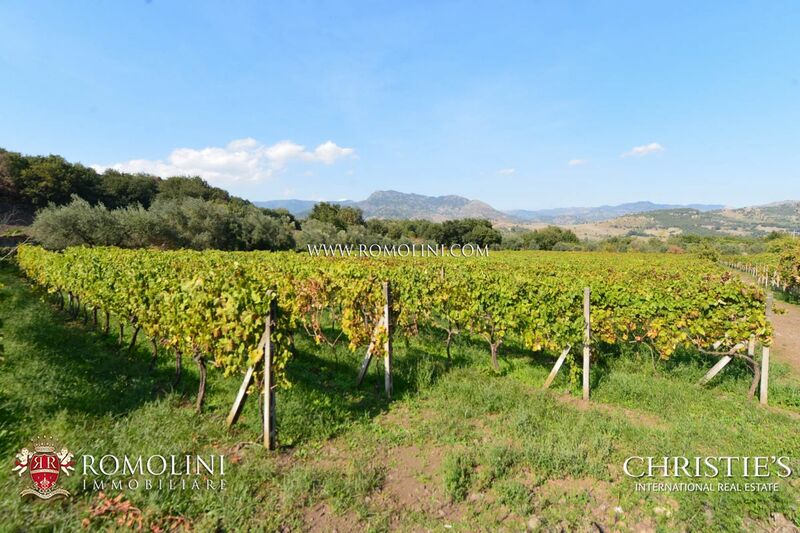 With the term palmento we refer to a concrete basin used by Greeks and Romans to crush grapes. 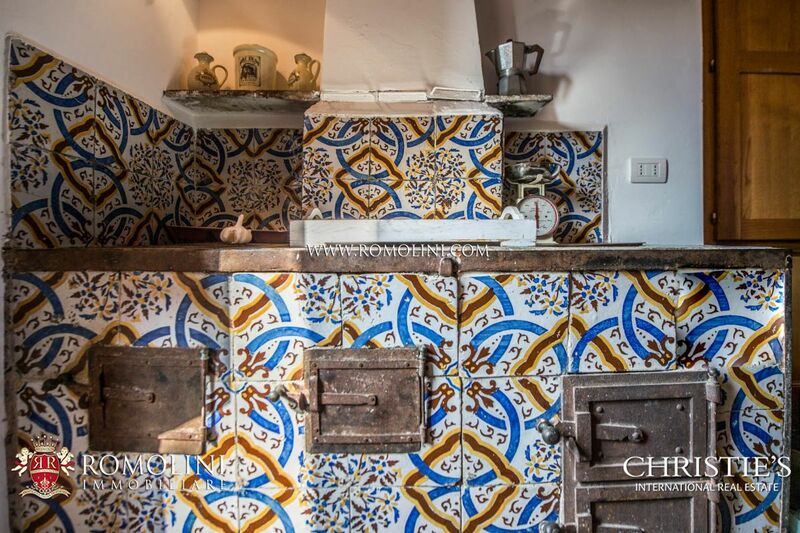 Another variant consists of basins carved directly into the stone. 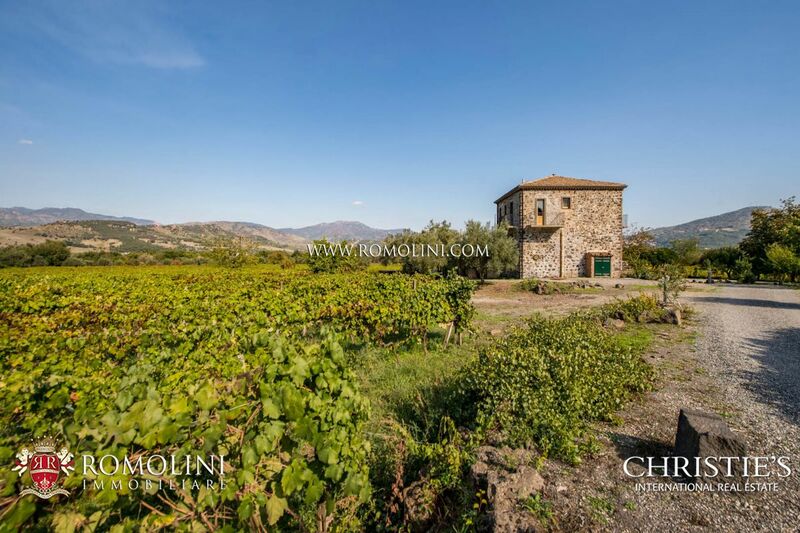 With the passing of centuries the term was metonymically extended to the buildings containing these basins (which were used during the Middle Ages for olive crushing too). 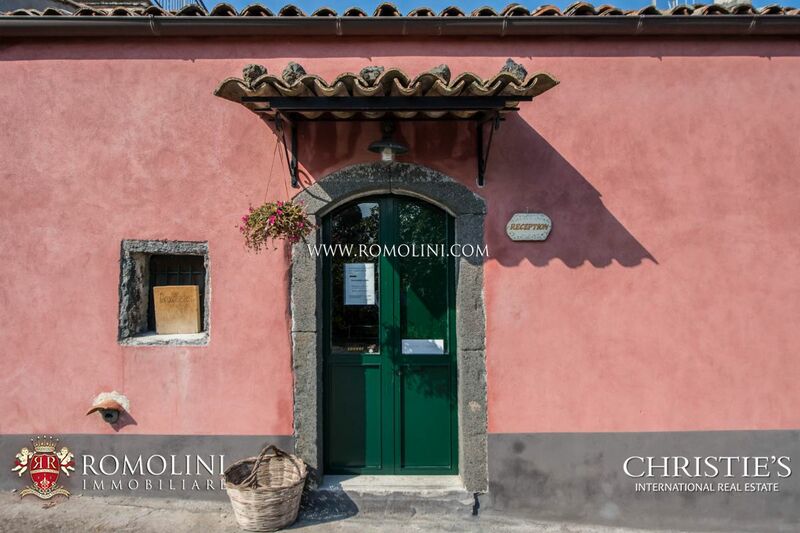 The main building of the property has been carefully restored and converted into residence and reception for the business. 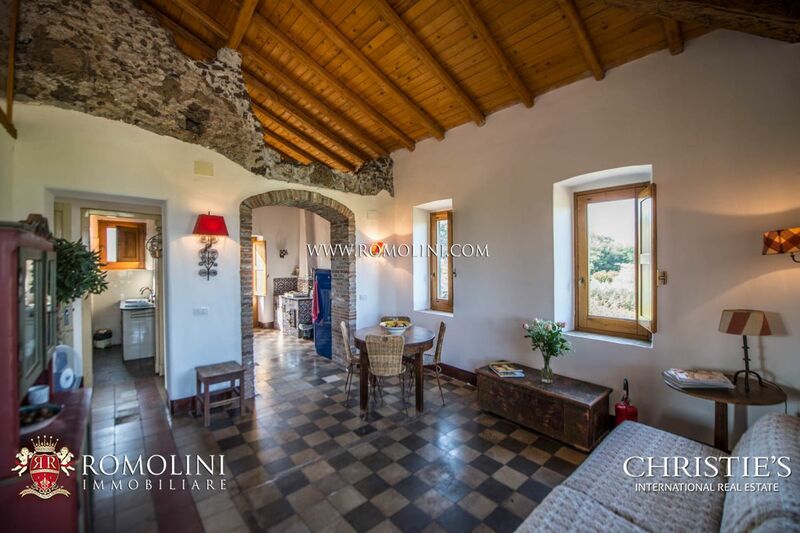 We have stone walls on the outside, partially plastered and painted in yellow and red, while on the inside we can find terracotta floors, wooden beams and exposed stone walls. 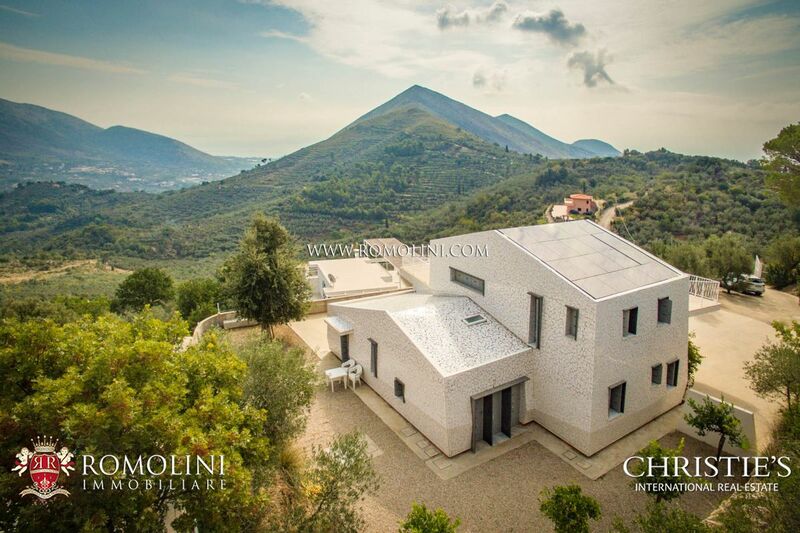 The other buildings were recently built, as one can see, and boast white-painted plastered walls. 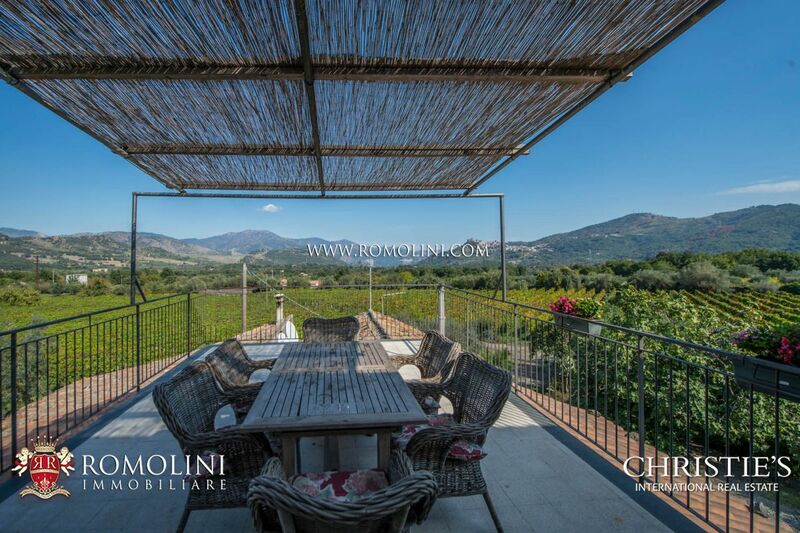 On the inside, modern finishes are coupled with traits typical to the Sicilian countryside. 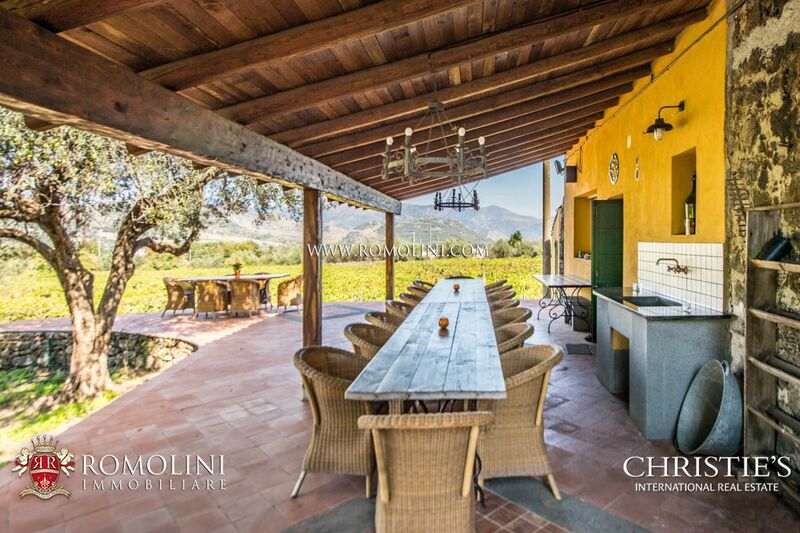 Furniture is all high-quality and we can find 0.90 x 2.10 m beds, 1.80 x 2.00 m sofa-beds, Smeg ovens, 4 stoves (gas), dishwashers and refrigerators, large wooden Fourcault tables (both inside and outside), Philippe Starck plastic chairs on the terraces and lined chairs for the inside. 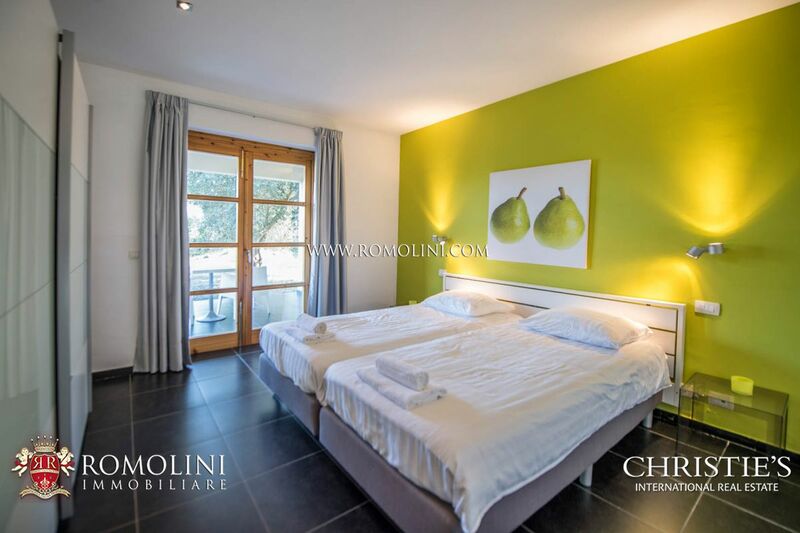 Each bedroom is fitted with a 3-doors wardrobe. 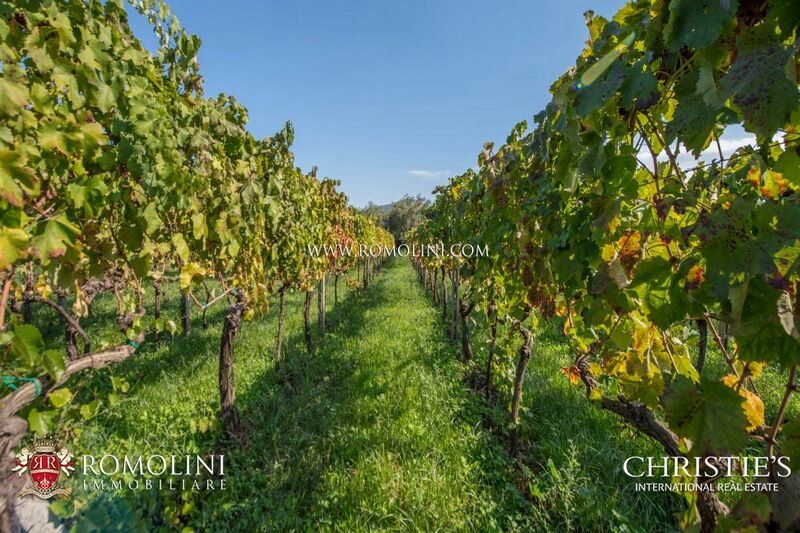 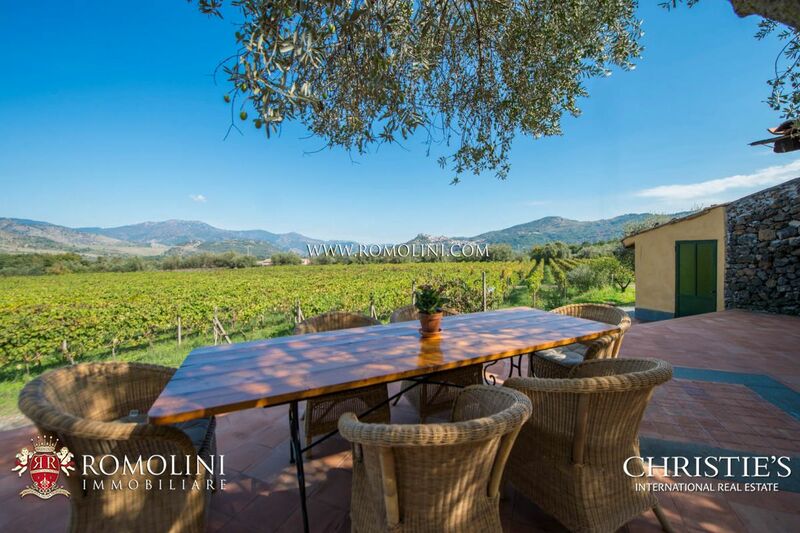 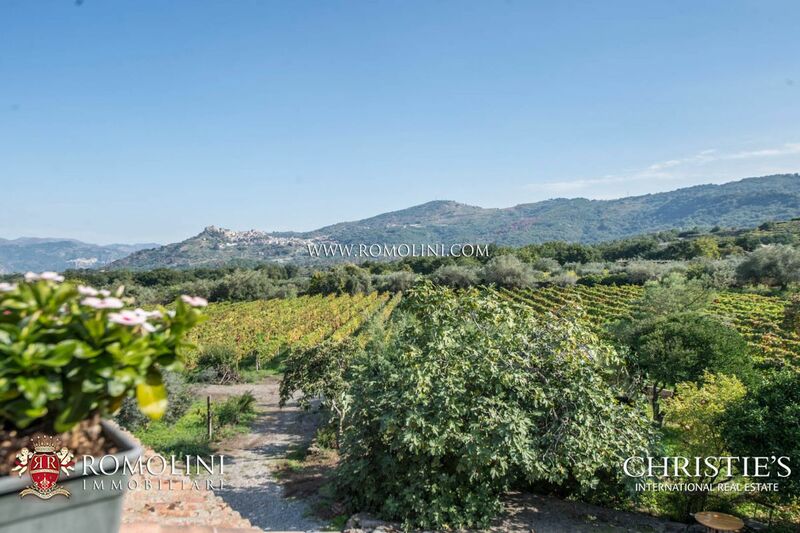 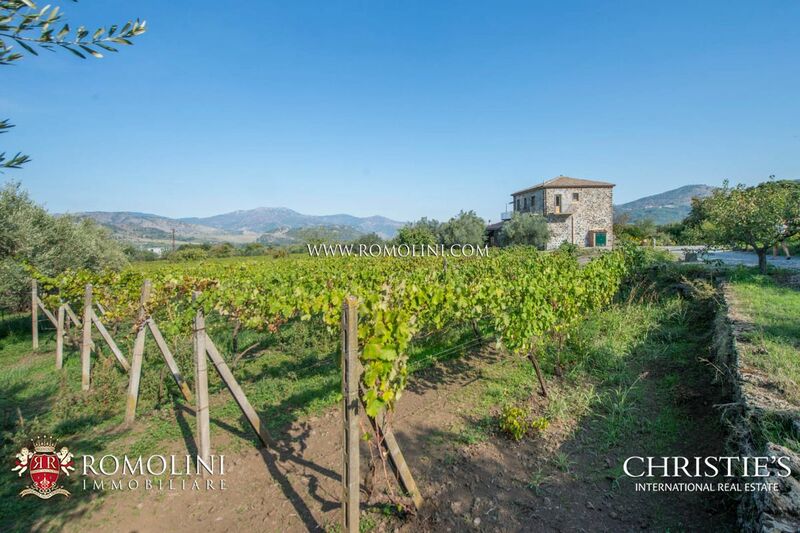 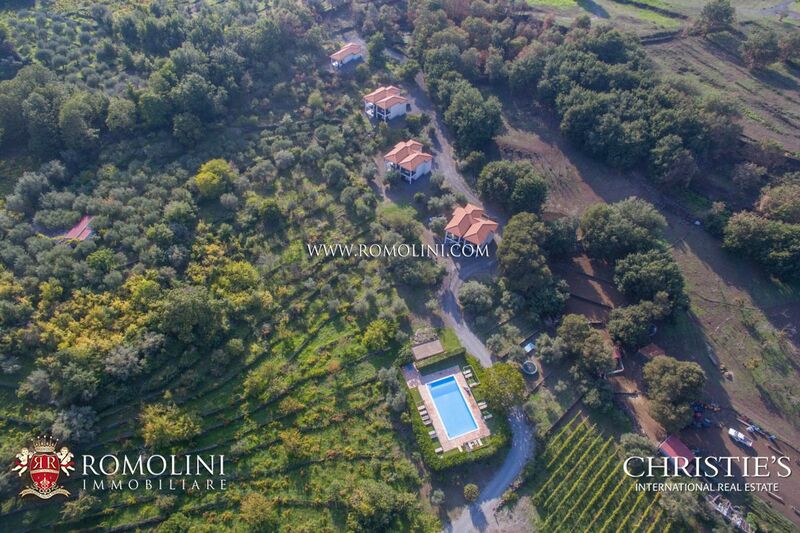 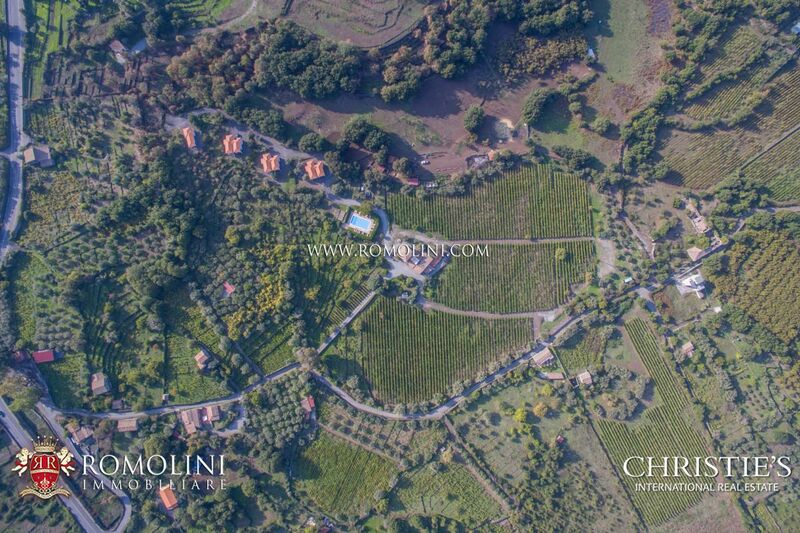 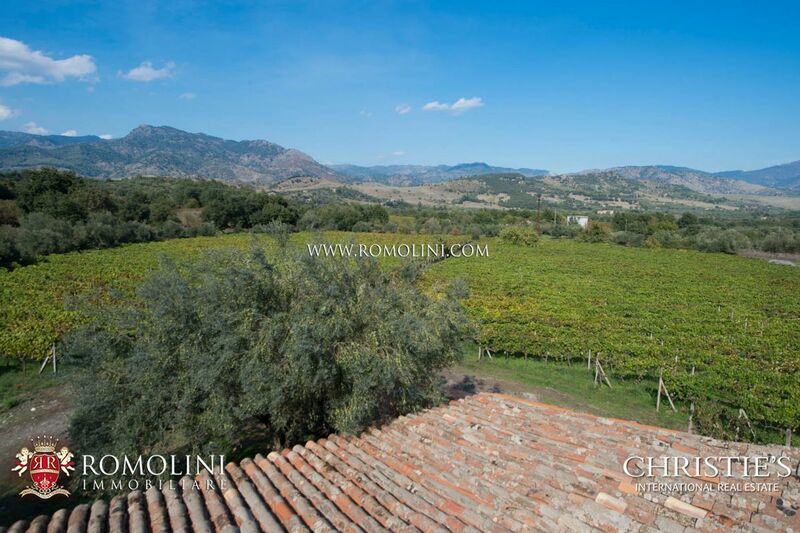 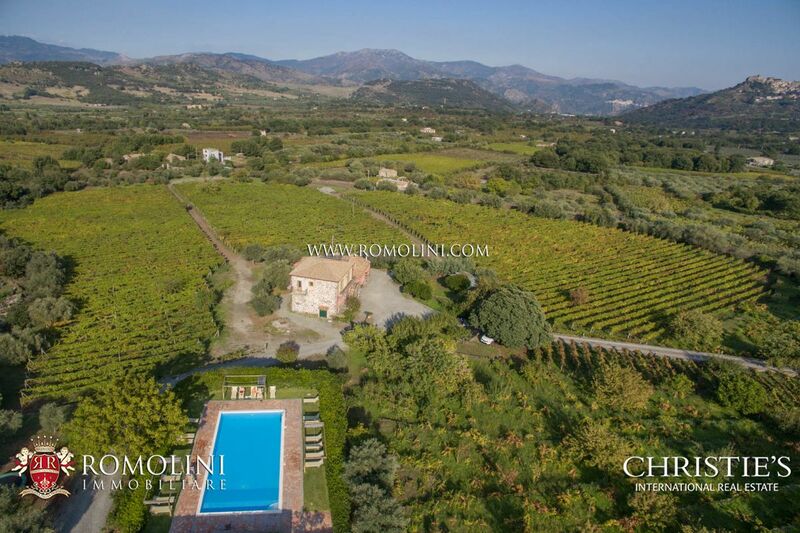 The property is completed by 5.5 hectares of land, split among vineyard, olive grove, citrus grove and garden. 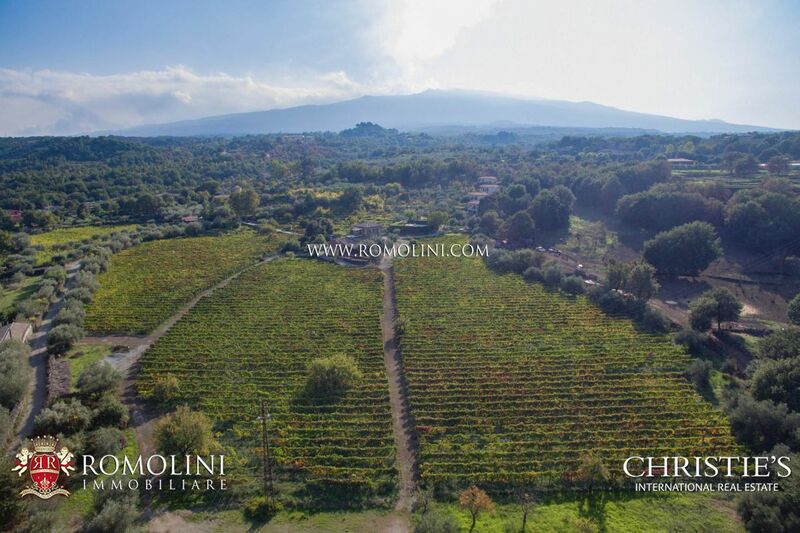 The vineyard, in particular, with its 3.5 hectares, hosts mainly Nerello Mascalese vines whose fruits are base for the renowned Etna Rosso DOC. 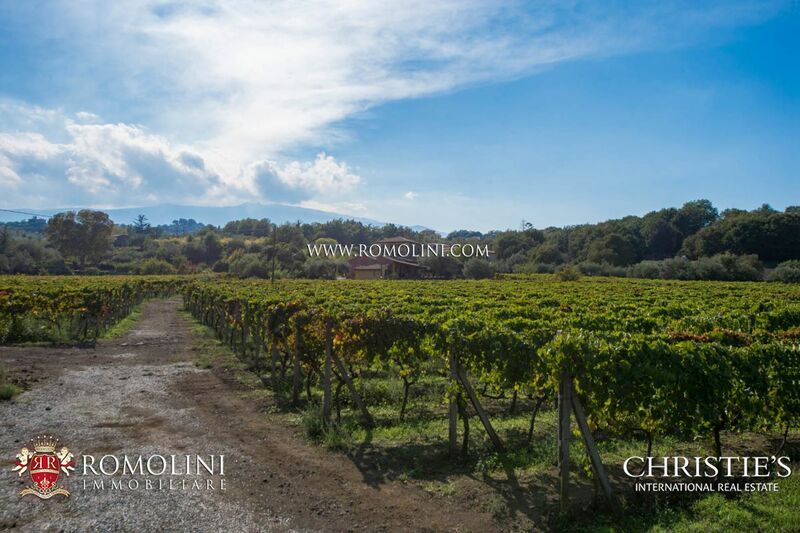 The vineyard's production ranges around 150 quintals of grapes per year. 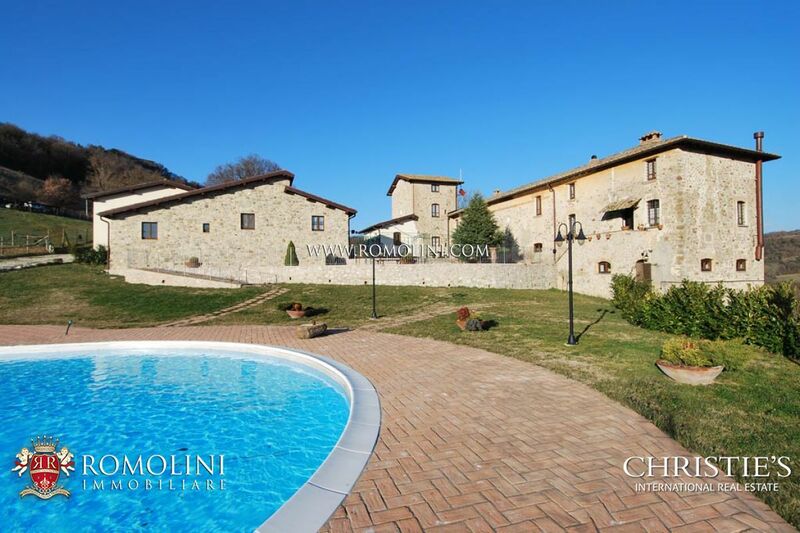 Finally, the property is fitted with a nice 14 x 7 m swimming pool with solarium and fixed shadow spots. 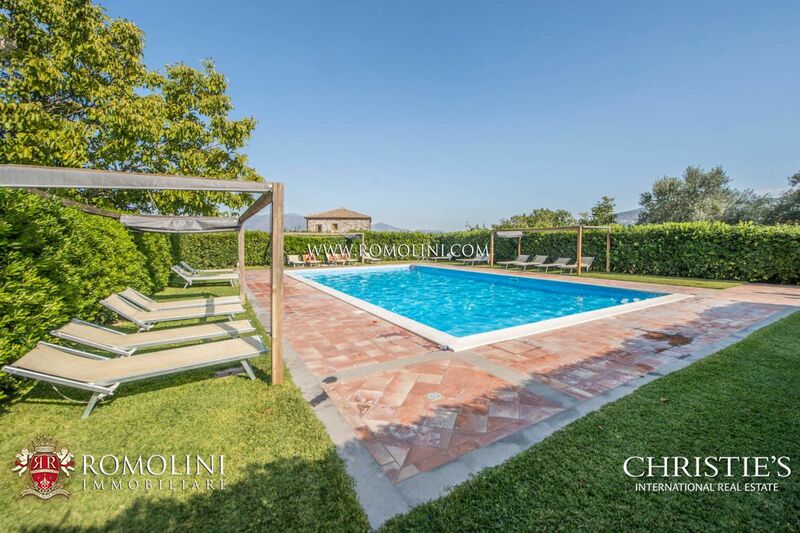 Near the pool one can find a small outbuilding including dressing room, showers and toilet. 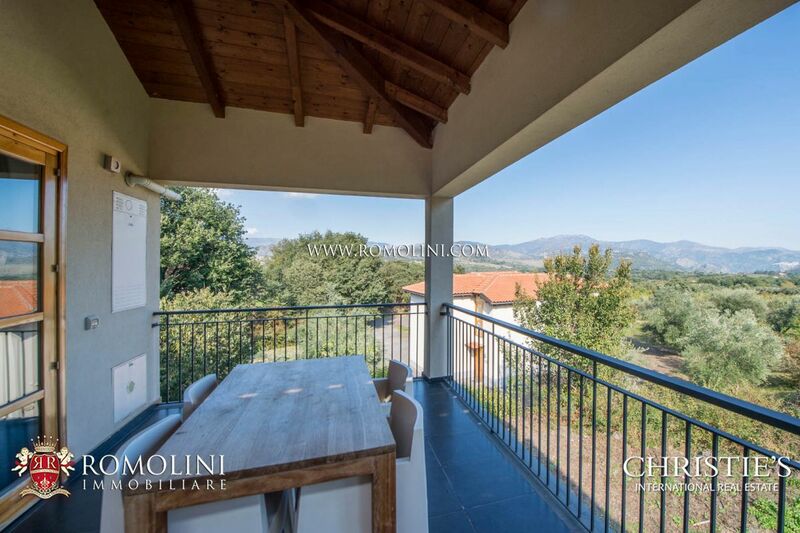 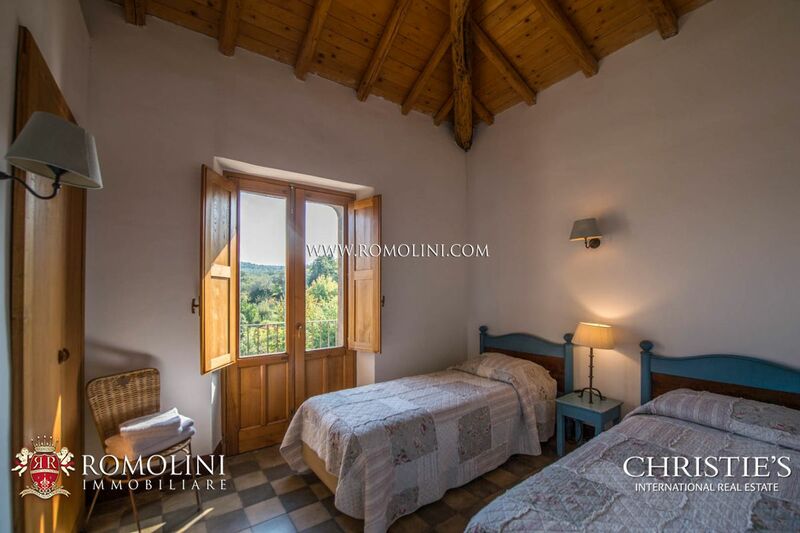 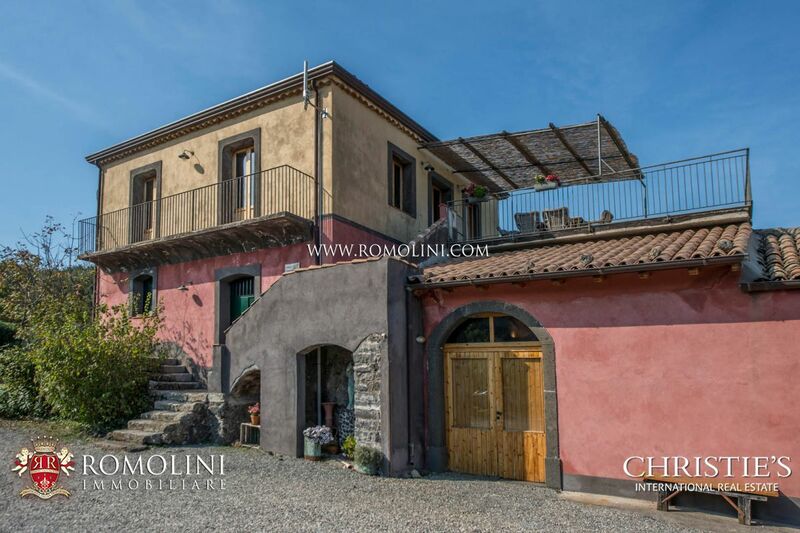 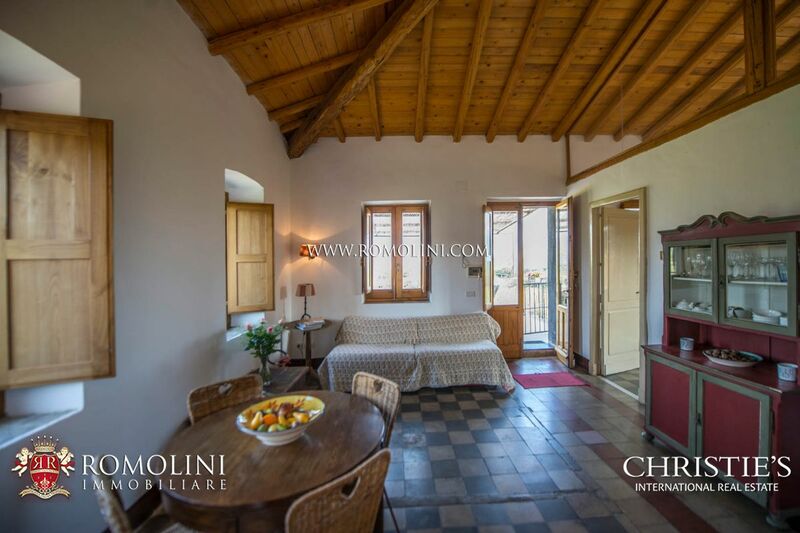 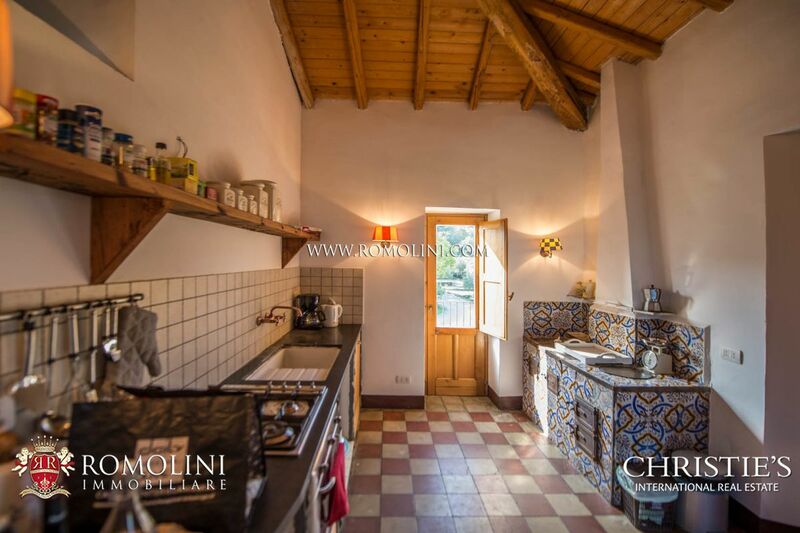 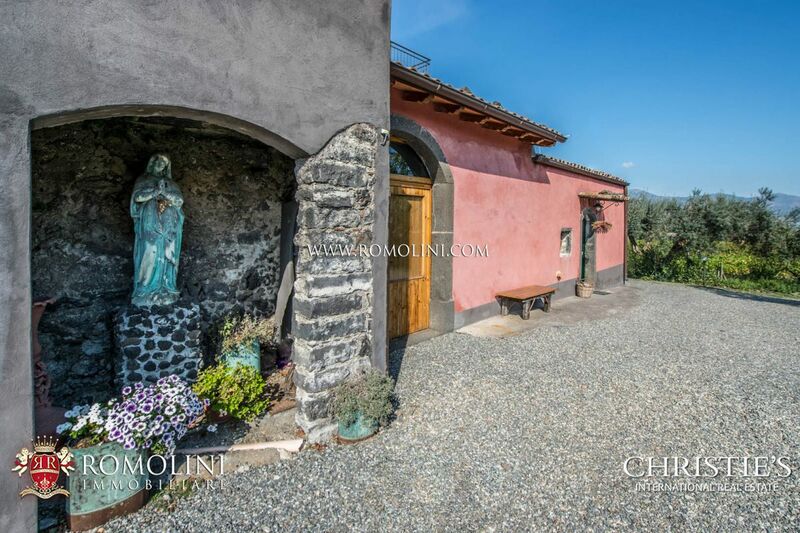 The property is currently run as a hosting business, thanks to the great number of beds available and the pleasant position with view on the Mount Etna. 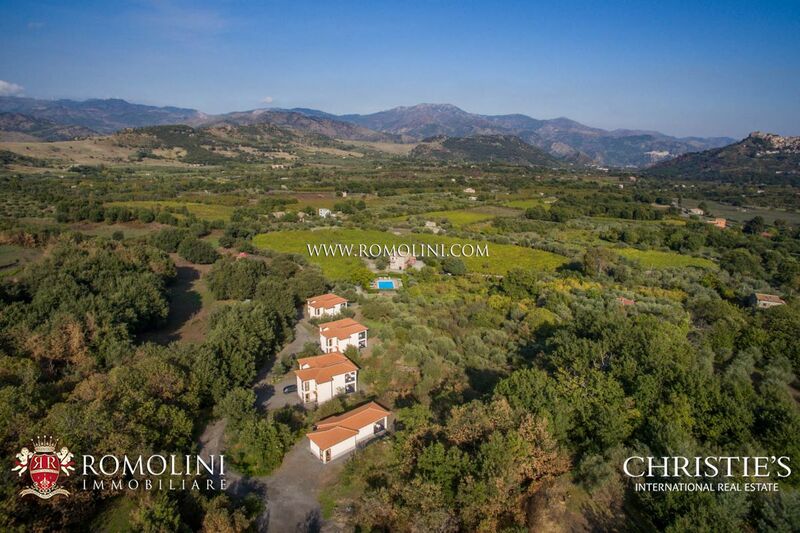 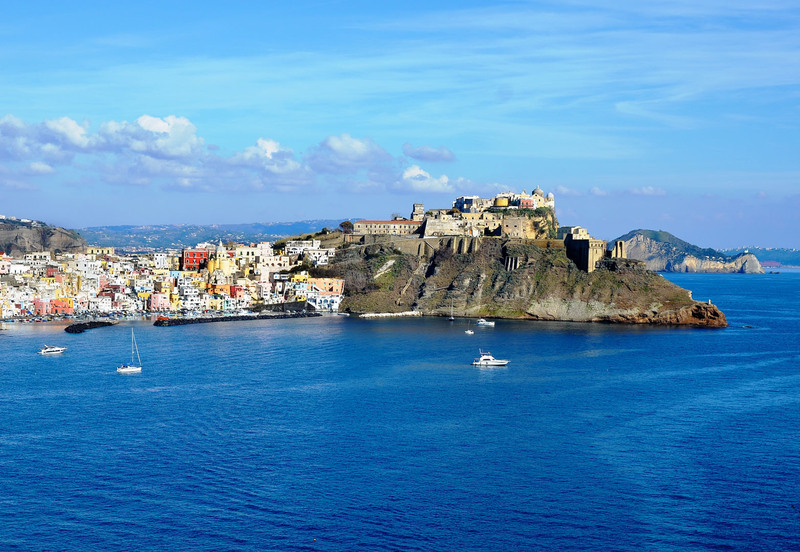 The location is perfect to enjoy the nature of Sicily: not far from the property one can visit the beautiful “Gole dell’Alcantara” (11km; 20’), the “Parco dell’Etna” (5km; 10’) and some of the most beautiful medieval towns of northern Sicily such as Castiglione di Sicilia (4km; 10’) and the hamlet of Castelmola (31km; 1h). 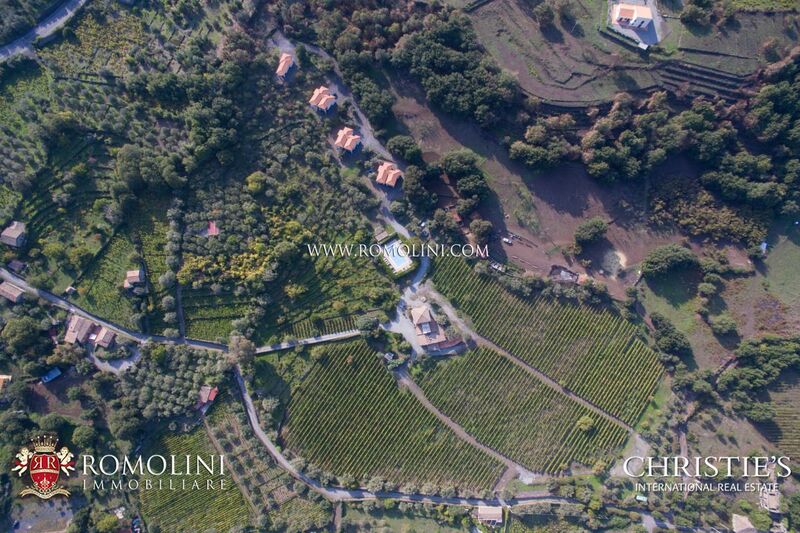 A permit has been obtained to build a new warehouse in the property.